With so many knives to choose from it can be difficult to choose which ones you want in your arsenal. You might be thinking, well what’s the difference? You’re in luck that you’ve stumbled across my site, because I will show you all the information you need! The reviews of my top five throwing knives below and the interactive chart and analysis that follows will help you decide what the best throwing knives are for you. 7 What exactly is a Throwing Knife? To save my readers time I have used all my experience and personal research to compile a list of my top 5 throwing knives along with a detailed review of each one. This list will save you hours of research time, and you can bet that only the best knives will make this top list. One of the most strong, reliable, and accurate throwing knives on my list is the Cold Steel True Flight Thrower. It is made of 1055 carbon steel with a baked-on black protective coating. One of my favorite features on this blade is this paracord handle wrap. It makes for a great grip and an attractive look. This thrower comes with a Cor-Ex sheath for storing or carrying. This knife is 12 inches in length, 9.7 ounces in weight, and has a blade thickness of 5 millimeters. This knife’s durability is unbelievable! It stands the test against the toughest tasks. This thrower is priced at $20 but also includes a limited manufacturer’s warranty. Second on my top list is the United Cutlery GH2033 Gil Hibben Competition Knife. It is a very attractive looking blade that has an ergonomically designed handle that will maximize the grip for throwing. It will also help the hand naturally grip the knife for consistency maximum accuracy in throwing which is why it is deemed a competition throwing knife. This three knife set comes in a single leather sheath making these a good choice for anyone wanting to practice competitive throwing. Each blade is crafted from a single piece of 420 stainless steel and is a total of 12 and 1/8 inches in overall length. These knives are well-balanced and a little heavier than most which is a huge plus. This extra mass allows these knives to stick in the target with ease. This is a great starter set for anyone coming in at a price of $39 for the set of three. Another top knife on my list from United Cutlery is their UC2772 Expendables Kunai Thrower. You may recognize this set of throwers since they were used by Lee Christmas in The Expendables movie. These are balanced perfectly and super accurate. Each knife is 12 inches in length and constructed from a single piece of Anodized AUS-6 stainless steel to give them a lasting durability. The blade is anodized double-edged and has a black cord-wrapped handle with a finger hole for handling. This three knife set also comes with a nylon sheath that has a bot clip and leg strap to allow for several carrying options. The come in at a very affordable $32.95. The Ridge Runner Ninja Throwers are the best throwing knives for anyone interested in starting out. 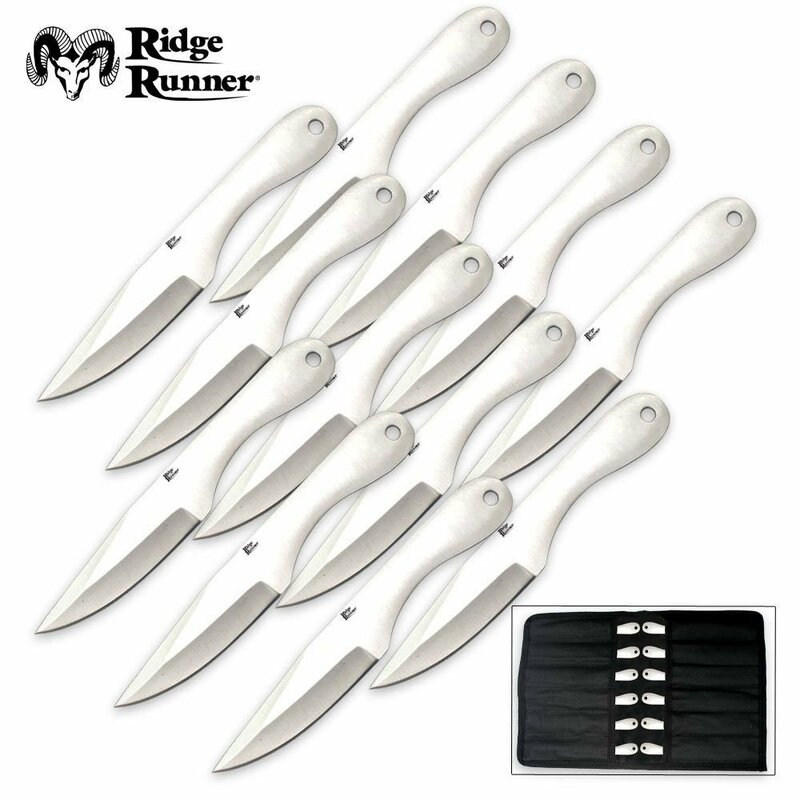 They are constructed from full tang stainless steel and this set of TWELVE knives comes in a roll up nylon sheath with a separate pocket for each thrower. These knives may not be as durable as others on my list but that is what makes them a great beginner set. . As long as you are throwing at wooden targets or similar these will last as long as you need them too. I would suggest practicing with just 6 of the knives at first until you get the hang of throwing. If a knife is chipped, bent, or fulled they can be easily sharpened with a wet stone. After gaining some experience you can use the other 6 brand new knives for riskier targets. They are 6 inches in length and weigh 49.4 grams each. These are also super sharp and have a good balance. One of the highlights of this set is that you get 12 knives for a low price of $21! One of the most popular throwing blades out in the market today is the Tact Force TF-707 Series and its popularity can be proven by the fact that this knife has over 400 positive reviews on Amazon which means that not only I, but also other knife enthusiasts have experience with this throwing knife and found it to be amazing. Your first look at this blade will have you sold on it! The dragon design is something you don’t see very often making this a very aesthetic knife, and it also available in many different colors. The handle is aluminum allowing it to be lightweight and balance out the knife. The serrated blade is a 3.5 inches long and made of lasting and durable stainless steel. The total length when it is closed is 4.5 inches. So not only is this knife durable and a looker, but it also has a couple of extra features that you don’t see on other similar priced knives. It has a pocket clip and a glass breaker on the end of the handle. These are all great qualities but what I like most about this knife is that it is economically priced. Considering the quality, durability, and craftsmanship you would expect it to cost well out of your price range – you can pick it up for less than $10! What exactly is a Throwing Knife? Are you wondering what a throwing knife, or thrower, is and what makes it different from other knives? Well, a thrower is a knife that is crafted and weighted so that it can be thrown at targets effectively and accurately. They can be used for many different occasions whether it be throwing competitions, just for fun, or on the rare occasion that you are in a survival situation and need them for protection. Knife throwing is considered to be an art form, sport, combat skill, and also as a form of entertainment for an audience. You have read the reviews of my personal top 5 throwing knives, but I have also compiled a tabular guide to compare all the top blades currently on the market. This guide will aid in helping you to make an informed choice of the best throwing knives to choose based on your needs. Overall Length – Combined blade and handle length in inches. I hope you have been able to make a decision as to which throwing knives are best for you after going through my top 5 picks and comparison guide. If I have missed any great throwing knives, or you have any suggestions to add to the comparison guide or a particular knife you would like to see reviewed, please leave a comment below. Thanks!